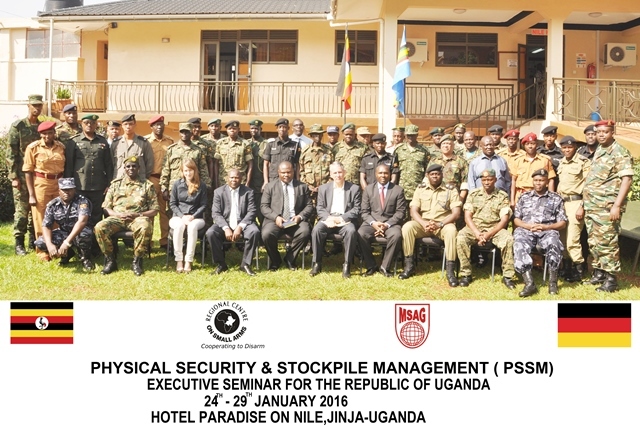 From 25 to 29 January 2016, BICC supported a physical security and stockpile management (PSSM) training for the Ugandan Armed Forces in Jinja, Uganda. The training was organized by the Regional Centre on Small Arms (RECSA) in collaboration with the Uganda National Focal Point on Small Arms and Light Weapons (SALW) and the Multinational Small Arms Group (MSAG). The training, which was fully funded by the German Federal Foreign Office, was attended by 27 members of the Ugandan military (Uganda People’s Defence Force), police, as well as prisons and wildlife services. 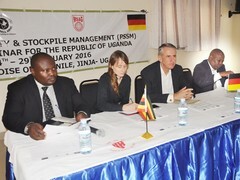 The major objective of the training was to improve the capacity of the Republic of Uganda to assess stockpiles, operational procedures and infrastructure and provide ways for potential improvements to stockpile security and management. The workshop was opened by the Undersecretary of the Ministry of Internal Affairs, Mr. Aggrey Winyi, and the German Ambassador to Uganda, His Excellency Dr Peter Blomeyer. In the course of the training, participants learned how to plan and execute interventions to improve safety and security of storage facilities and stockpiles. The teaching modules were based on international standards for safe and secure storage of arms and ammunition (International Small Arms Control Standards and International Ammunition Technical Guidelines, ISACS / IATG). During a field practical exercise at an armoury near the College of Logistics and Engineering, the participants had the opportunity to make use of their newly acquired knowledge.